Hopefully, by now, you’ve had a chance to read PART 1 of this 4-part Ferrari 599XX Speed Machines series. By doing so, you learned of the limitations the Speed Machines line had in 2010 and for the rumored discontinuation of the Ferrari license. 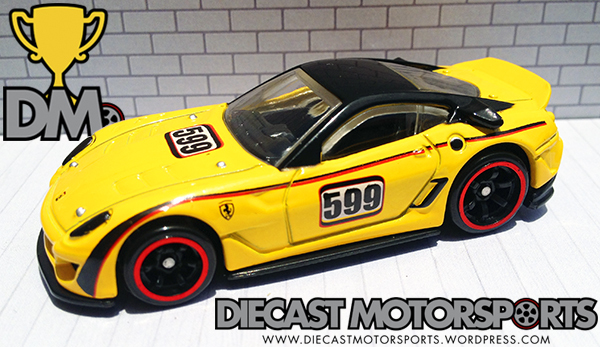 The 2nd colorway of the Ferrari 599XX turned out to be this bright yellow. Gone was the authentic racing scheme and a new unlicensed scheme was put out. This version was actually harder to find (for me) than the black version which is next. It could have been the fact that yellow cars sell…when every other car isn’t yellow as well. Its a color that screams “caution” or in this case “attention” which prompts casual buyers to buy. Currently, prices are all over the board for this version. The going rate seems to be around the $30 range (carded). With seemingly a limited supply of this version, look for prices to rise. RELEASE DETAILS: Yellow Enamel Body with Black Roof (metal). Clear Windows. Black Interior. Red-Rimmed, Black Co-Mold 6-Spoke (CM6) Wheels. Base Base (plastic). Made in Malaysia. Toy# T4408. Released in 2010 as part of the Speed Machines.